Continue reading Investigator recommended shelving Teitel case. Miami Herald: "'This is Israel to me,' says a settler from Miami"
EFRAT, West Bank -- Efrat, 10 miles outside Jerusalem, has become known for its Anglo-Saxon population. Nearly 30 percent of the town lies on Palestinian land that was confiscated from the nearby Arab village of al-Khader, according to a survey completed by Peace Now. New York Rabbi Shlomo Riskin and Israeli Moshe Moskovics jointly founded it with money donated by Florida businessman Irving Moskowitz. Continue reading Miami Herald: "'This is Israel to me,' says a settler from Miami". I just learned that Peace Now Secretary General Yariv Oppenheimer was on Israeli terrorist Yaakov Teitel's hit list. According to minutes from Teitel's police interrogations, which were made public today on Israeli news sites Ynet and NRG, Teitel said that he had planned to follow Yariv and possibly attack him. The High Court of Justice's decision, in a panel headed by Supreme Court President Dorit Beinisch, to end the ban on Palestinians using Route 443 is one of the most correct and just decisions the court has made in recent years. Continue reading Haaretz editorial: No such thing as deluxe occupation. Yesterday, I posted some thoughts about the impact of Israel's deterrence vis-a-vis Hamas and Hezbollah. Today, in Haaretz, Israeli political scientist Gabi Sheffer examines the issue of Israeli deterrence, and reaches the same conclusion. Continue reading Deterrence does not secure peace II . Israel's secret service, the Shin Bet, today published its end of year report, showing that 2009 was one of the quietest years in Israel's security history. For the first time in over a decade, there were no suicide bombings. Only 15 Israelis were killed by Palestinians, most of them soldiers who took part in Operation Cast Lead in January. Only 234 Israelis were injured by Palestinians, most of them (185) soldiers during the Gaza war in January. The Shin Bet published its report in Hebrew only. A decent story in English on the report was published by Ynet. Continue reading Deterrence does not secure peace. Ha'aretz: "Israel approves new building plan for West Bank settlement"
In an unusual step, the state announced on Tuesday its plan to promote planning and construction in the northern West Bank settlement of Kiryat Netafim, Army Radio reported Wednesday. Left wing human rights group Peace Now petitioned the High Court of Justice recently against the construction of 14 structures that were illegally built, some of them on Palestinian land without any authorization, according to the petition. In response to the petition, the Defense Ministry approved the Kiryat Netafim construction plans, to legalize the construction of the 14 structures in question. Continue reading Ha'aretz: "Israel approves new building plan for West Bank settlement". Glenn Kessler has an interesting piece in today's Washington Post talking about the Obama Administration's plans for additional sanctions against Iran (full text after the break). Interesting, because Kessler talks to senior Obama Administration officials who make clear that "We have never been attracted to the idea of trying to get the whole world to cordon off their economy." And who argue that "We have to be deft at this, because it matters how the Iranian people interpret their isolation -- whether they fault the regime or are fooled into thinking we are to blame." Kessler adds that "As a result, top officials show little apparent interest in legislation racing through Congress that would punish companies that sell refined petroleum to Iran. 'Sanctions would not be an alternative to engagement,' another senior official said. 'Our intention is to keep the door open.'" For anyone who might not have been paying attention, this Glenn Kessler report is completely consistent with what Obama Administration officials have said in the past about IRPSA - most notably in a largely ignored appearance by Deputy Secretary of State Jim Steinberg and Treasury Undersecretary for Terrorism and Financial Intelligence Stuart Levey before the Senate Banking Committee hearing about IRPSA on 10/6/09, and in the letter sent by Deputy Secretary of State Jim Steinberg to Senate Foreign Relations Committee Chairman Kerry (D-MA) on 12/11/09. And again, for anyone who has not been paying attention, APN has opposed IRPSA from the start - generally for the same reasons articulated by Administration officials. We have been one of the sole voices - and the sole voice in the Jewish community - aligned with the Obama Administration on this issue, and pressing both the House and Senate to reject or amend this very problematic bill (including offering specific amendments to both versions of the bill). Congress comes back next month, and Senate Majority Leader Reid (D-NV) has already promised to take swift action on IRPSA. It remains to be seen if the Senate Majority leader will heed the Administration's words -- permitting the bill to be amended in substantively significant ways or slow-walking the bill until such time as the President has implemented his own new sanctions strategy. Continue reading WaPo: Obama Admin agrees with APN - IRPSA is a bad idea. YNET: "Peace Now: High Court decision is Israel's saving grace"
Over the weekend the news broke in the Israeli press that the government of Israel had approved the issuance of new tenders for nearly 700 units in East Jerusalem settlements (377 in Neve Yaakov, 117 in Har Homa and 198 in Pisgat Ze'ev). Continue reading With New Tenders, Bibi Goes Nuclear on Jerusalem (Again). This morning NPR featured the story of a Gazan who is unable to complete her education in Bethlehem because Israeli officials won't let her stay in the West Bank. It is a difficult story. Berlanty Azzam was expelled from the West Bank and is unable to return to Bethlehem for the two months necessary to complete her BA. Continue reading Backing education for Gazans. A survey of Israeli and Palestinian public opinion, conducted as a joint project by Hebrew University and the Palestinian Center for Policy and Survey Research, was released today. Continue reading Israeli & Palestinian public opinion. Continue reading Middle East Peace Report- December 21, 2009. Alpher answers questions about Deputy Foreign Minister Danny Ayalon's "Open Letter to the Arab World," and the level of deterence Israel has achieved through Israel's recent wars with Hezbollah (2006) and Hamas (2009). Continue reading Hard Questions, Tough Answers with Yossi Alpher- December 21, 2009. Continue reading APN Legislative Round-Up for the Week Ending December 18, 2009. Speaking to the United Synagogue of Conservative Judaism's biennial convention on December 7, Ambassador Michael Oren crossed a red line. He described J Street as "a unique problem... when it comes to the survival of the Jewish state, there should be no differences of opinion. You are fooling around with the lives of 7 million people. This is no joke." 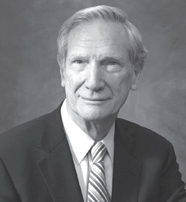 Continue reading Ambassador Oren's Misstep. Israel's firebrand Foreign Minister Avigdor Lieberman said today that the objective of the partial moratorium on West Bank settlement construction is to allow Israel to build openly and without restriction in ten months, when the moratorium expires. Lieberman spoke to a crowd of (mostly) settlers in Ariel. The Israeli news sites earlier today mistranslated Lieberman. I transcribed the relevant quotes from an Israel Radio recording. Here is my translation, with some contextual comments. Continue reading Avigdor Lieberman: Moratorium Intended to Allow Kosher Construction When Freeze Expires. 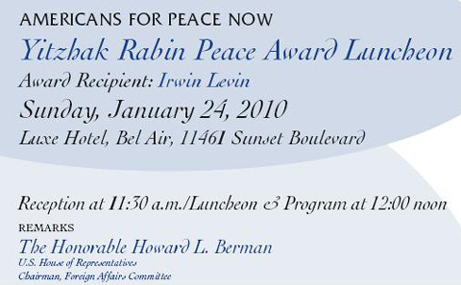 Continue reading Yitzhak Rabin Peace Award Luncheon - RESPONSE FORM. American Prospect: "The Settlement Freeze That Isn't"
If there were any doubt of Benjamin Netanyahu's commitment to the settlement enterprise, he dispelled it this week. "No Entrance To Bibi's Freeze Inspectors," reads the long, professionally printed banner hanging at the eastern entrance to Ariel. Ariel has a reputation of being a relatively moderate settlement. Its residents are mostly secular suburbanites; its eternally re-elected mayor belongs to Prime Minister Bibi Netanyahu's mainstream right-wing Likud. The Ariel finger -- the heavily settled strip of land joining Ariel to Israel -- is one of those blocs that centrist Israeli politicians insist will stay in Israeli hands under a peace agreement. Continue reading American Prospect: "The Settlement Freeze That Isn't". Critics (including this writer) of HR 2194 -- the Iran Refined Petroleum Sanctions Act (IRPSA), which was passed by the House yesterday -- have argued that if the US wants to put pressure on the government of Iran, sanctions that deliberately cause suffering to the Iranian people are unlikely to do the job and could well backfire. During yesterday's House debate on IRPSA, several speakers attempted to refute this criticism by raising the South Africa precedent. They noted, correctly, that in the South Africa context, crippling economic sanctions worked. It is clear why supporters of IRSPA want to focus on South Africa: this is the only example in recent history where sanctions similar to those being proposed for use against Iran achieved their intended purpose. But those raising the South Africa ignore a key fact: while the sanctions may be similar, their justification and intended purpose are not. These differences render the comparison specious and the conclusion - that sanctions that worked in South Africa will work in Iran - dubious. Continue reading Iran is not South Africa. Continue reading Moran-Ingles letter on education for Gazans. Continue reading Text of Congressional letter on Gaza. NY Jewish Week: "Settlement Funding Vote Sparks New Debate"
The Israeli cabinet's vote Sunday to pour money into 91 outlying West Bank settlements has touched off a fierce debate here about the propriety of funneling resources into settlements that may be abandoned in a peace treaty. "Any resources you add to the outlying settlements are an obstacle to peace either now or down the road," according to Rabbi Eric Yoffie, president of the Union of Reform Judaism, a group that has long opposed continuing settlement in the West Bank. "Those settlements have to be removed in order for a Palestinian state to come into being." Continue reading NY Jewish Week: "Settlement Funding Vote Sparks New Debate". - Today the House Committee on Oversight and Reform's Subcommittee on National Security and Foreign Affairs held a hearing entitled "Iran Sanctions: Options, Opportunities and Consequences." Witnesses were Dr. Suzanne Maloney, Senior Fellow, The Brookings Institution (text of prepared testimony); Dr. George Lopez, Professor of Peace Studies, University of Notre Dame (text of prepared testimony); Robin Wright, Jennings Randolph Fellow, U.S. Institute of Peace (text of prepared testimony); and Ambassador James Dobbins, Director, RAND International Security and Defense Policy Center (text of prepared testimony). In addition, NIAC's Trita Parsi was invited to provide a statement for the hearing. For a summary of the hearing - which included all four witnesses saying that if they were voting, they would vote "no" on IRPSA - can be viewed here. - Surprising absolutely nobody, the House voted this afternoon to suspend the rules and pass HR 2194, the Iran Refined Petroleum Sanctions Act (IRPSA), by a vote of 412-12, with 4 voting "present." The full roll call vote can be viewed here. Voting "No" were: Baldwin (D-WI), Blumenauer (D-OR), Conyers (D-MI), Duncan (R-TN), Flake (R-AZ), Hinchey (D-NY), Kucinich (D-OH), Lynch (MA), McDermott (D-WA), Moore (D-WI), Paul (R-TX), and Stark (D-CA). Voting "Present" were: E.B. Johnson (D-TX), Kilpatrick (D-MI), Lee (D-CA) and Waters (D-CA). Friday's Round-Up will include excerpts from key floor statements and statements inserted into the record. - As the House was getting ready to move on the very misguided and potentially counter-productive IRPSA, yesterday (12/14/09) two new Iran bills were introduced. These two bills embrace a much different approach: targeting Iranian government officials with sanctions and proposing tangible things to support the Iranian people. APN strongly supports both of these bills and is urging members of Congress to cosponsor and support them. - The first bill is HR 4301, introduced by Reps. Moran (D-VA), Inglis (R-SC) and Delahunt (D-MA). Entitled the Iran Digital Empowerment Act (IDEA), this bill would ensure that the Iranian people have access to software and related technology crucial to internet communications amongst themselves and between Iran and the outside world. It would also ensure that Iranian private citizens have access to tools that allow them to circumvent Iranian government efforts to stifle and monitor internet communications. At present, US sanctions - which have not been updated recently and have thus been overtaken by technology - has already resulted in some such tools and services being unavailable to Iranians. - The second bill is HR 4303, introduced by Reps. Ellison (D-MN) and Delahunt (D-MA). Entitled the Stand with the Iranian People Act (SWIPA), this bill would (a) bar the issuance of visa to or entry into the US of any Iranian government official credibly alleged to have involvement in human rights abuses; (b) prohibit US procurement contracts with companies that have aided Iranian government efforts to stifle free speech by providing censorship or monitoring technology; and (c) authorize US non-profit organizations' activities in Iran for the provision of humanitarian and people-to-people assistance. JTA: "Obama and Kerry slowing sanctions legislation push"
Only Americans for Peace Now is publicly aligned with the administration in counseling changes to the proposed sanctions. WASHINGTON (JTA) -- Unilateral U.S. sanctions against Iran are on track, Senate officials say, but taking the slow train. Sen. John Kerry (D-Mass. ), the chairman of the Senate Foreign Relations Committee, needs time to consider the bill, his spokesman, Frederick Jones, told JTA. Jones strongly refuted rumors that Kerry would keep the legislation from reaching the floor, although that is in his power as a committee chairman. Continue reading JTA: "Obama and Kerry slowing sanctions legislation push". NY Jewish Week: "Iran Sanctions, the Left Wing split and fears about nuclear containment" & IPS: "US: One Step Closer to Unilateral Sanctions Against Iran"
APN said it can't support the current sanctions measure without sweeping revisions "to focus the legislation on smart, targeted sanctions rather than on 'crippling' sanctions that inflict widespread suffering on the Iranian people." Continue reading NY Jewish Week: "Iran Sanctions, the Left Wing split and fears about nuclear containment" & IPS: "US: One Step Closer to Unilateral Sanctions Against Iran". JTA: "House letters address Gaza crisis"
WASHINGTON (JTA) -- Two letters circulating in the U.S. House of Representatives address the humanitarian crisis in the Gaza Strip. One letter, initiated by U.S. Reps. Jim McDermott (D-Wash.) and Keith Ellison (D-Minn.), asks President Obama to press Israel and Egypt for "immediate relief" from the blockade of Gaza in place since Hamas' takeover in 2006, and intensified following last winter's Israel-Gaza war. Continue reading JTA: "House letters address Gaza crisis". Here is an Action Alert I just sent out. Continue reading New sanctions could undermine Iran effort. * targets the Iranian people, in the hope that if the people become miserable enough they will pressure their government to change course. This is a strategy that few experts believe will work, and a strategy that has a very poor track record in other contexts (Iraq, Cuba, Gaza). Indeed, experience has demonstrated that with sanctions like these, the most likely and immediate result will be a backlash by the people of Iran against the United States, not against the Iranian regime. * limits US options regarding Iran for many years to come, by imposing requirements that could conflict with future efforts to negotiate an international solution regarding Iran's nuclear program and by extending current sanctions legislation (the Iran Sanctions Act, which does not expire until 2011) until 2016, without any discussion or debate. * conflicts with the approach currently being pursued by the Obama Administration, which is focused on building international support for multilateral sanctions. Last week the Administration weighed in regarding the Senate version of IRPSA, noting that "We are entering a critical period of intense diplomacy to impose significant international pressure on Iran. This requires that we keep the focus on Iran. At this juncture...this legislation, in its current form, might weaken rather than strengthen international unity and support for our efforts." Continue reading APN to House: Vote No Tomorrow on IRPSA. Alpher answers questions on last week's arson at a West Bank mosque and the Knesset's decision to mandate a popular referendum on territorial concessions to Syria. Continue reading Hard Questions, Tough Answers with Yossi Alpher- December 14, 2009. "we are entering a critical period of intense diplomacy to impose significant international pressure on Iran. This requires that we keep the focus on Iran. At this juncture, I am concerned that this legislation, in its current form, migth weaken rather than strengthen international unity and support for our efforts. In addition to the timing, we have serious substantive concerns, including the lack of flexibility, inefficient monetary threshhold and penalty levels, and blacklisting that could cause unintended foreign policy consequences..."
Articles on Settlements Included as "High Priority Areas"
Jerusalem Post: "Isolated settlements kept on 'priority map' - to Labor's dismay"
CNN: "West Bank settlements to receive more funding under plan"
Jerusalem Post: "Ashkelon mayor, Peace Now fume at spending preferences"
YNET: "Labor ministers: Help periphery, not settlements"
Jerusalem Post: "Peace Now: Gov't marked high-income settlements as 'priority areas'"
Continue reading Articles on Settlements Included as "High Priority Areas". Articles re: Settlement/Outpost Construction During "Freeze"
AP: "Showdown looms over West Bank construction curb"
CS Monitor: "Israel settlement freeze shields dismantling of illegal outposts"
Yedioth Ahronoth: "One Hand Freezes, the Other Invests"
AP: "Settlers protest in Jerusalem against freeze"
Jerusalem Post: "West Bank building up despite freeze"
Time: "Protests Mount Against Israel's Settlement Freeze"
Continue reading Articles re: Settlement/Outpost Construction During "Freeze". Peace Now called the incident "a Jewish pogrom" and warned that continued provocation by extremists could lead to a new Palestinian intifada. Jerusalem Post: "Palestinians protest mosque arson"
AFP: "Officials Blame 'Extremist' Settlers for Arson Attack on West Bank Mosque"
Continue reading Articles on arson attack against West Bank Mosque. Today, as Jews worldwide commemorate the desecration of the Temple and celebrate its rededication, Jewish extremists, most likely West Bank settlers, desecrated a mosque in a Palestinian village near Nablus. The mosque, in the Palestinian village of Yasuf, was torched. Copies of the Koran were burnt. Hateful graffiti in Hebrew was sprayed at the site referring to the settlers' "Price Tag" vigilante operation to attack Palestinians and Israeli security forces to deter Israel's authorities from enforcing the law on the settlers. This is not the first time that Jewish extremists intentionally desecrate a Muslim house of worship in order to foment violence. It is a deplorable tactic that should be confronted decisively by the Israeli authorities. There should be zero tolerance when it comes to such hate-crimes that might ignite violence throughout the West Bank and the region. We are gratified that Israel's Peace Now movement will send a delegation to the village of Yasuf over the weekend, to express solidarity and denounce the settlers' ongoing violence. We are also happy to see that the Anti Defamation League issued a strong condemnation. We urge other American Jewish groups to do the same. On this Hanukkah, lets all think about the importance of fighting hatred and fanaticism and about the imperative of pursuing peace. Continue reading APN Legislative Round-Up for the Week Ending December 11, 2009. Yesterday marked the two week anniversary (weekiversary?) of the announcement of Israel's settlement moratorium. Lo those many days ago, when the moratorium was first announced, we welcomed it and expressed our hope that "this Israeli decision, backed by good faith, will be sufficient to catalyze new Israeli-Palestinian peace negotiations. Such negotiations are the only real path for resolving the Israeli-Palestinian conflict...implemented properly, this moratorium could serve the cause of peace." Despite what some critics say, it is far too early to judge whether the moratorium is a success or failure in serving the cause of peace. However, it is not too soon for an honest examination of what the moratorium has achieved thus far and the challenges to it that have already arisen. And it is not too soon to start keeping a balance sheet, given that how the moratorium fares - and is perceived as faring - in these early weeks and days is critical to the credibility of everything the Obama Administration has done thus far and to its efforts going forward. So let's get to the balance sheet. Continue reading Settlements in Focus (December 10, 2009): The Settlements Moratorium: An Early Accounting. Twenty-one years ago, as a journalist, I was arrested in the West Bank while covering Palestinians celebrating their declaration of independence. While I was detained for a technicality - violating a "closed military zone" order - hundreds of Palestinians were detained that day for rejoicing. The Israeli military governor of the West Bank and Gaza issued stern orders at the time, outlawing any expression of happiness. No singing. No dancing. The Israel Defense Forces imposed a curfew on almost all of the West Bank population, and cut the electricity to most Palestinian towns to prevent people from watching, on TV, the Palestinian National Council in Algiers declaring Palestinian independence. Continue reading Unilateral Palestinian Statehood: Not a Good Idea - New Op-ed. Washington Jewish Week: "Unilateral Palestinian statehood?" This is time for Israeli and Palestinian leaders to re-engage, to take advantage of the leadership that this committed U.S. American administration is offering and to do what it takes to bring peace to their peoples. Continue reading Washington Jewish Week: "Unilateral Palestinian statehood?". Jim Gerstein, a Washington pollster and an APN Board member, talks about the poll he recently prepared for the New America Foundation, showing that Israeli support for peace with the Palestinians and Israeli approval of President Obama are greater than typically believed. Click here for the full survey. Click here for Jim's analysis of the poll. Continue reading New poll: Israeli public needs peace. YNET: "'Sanhedrin': Kill prisoners if Shalit doesn't return"
"If Gilad Shalit, Heaven forbid, is executed or not returned in peace, prisoners will be executed immediately," ruled the court of the reestablished "Sandhedrin" organization, in a ruling published last week on the backdrop of the negotiations to release the captured Israeli soldier. Continue reading YNET: "'Sanhedrin': Kill prisoners if Shalit doesn't return". YNET: "Settlement freeze gets icy support"
Several dozen Peace Now and Meretz activists held a rally across from the Defense Ministry offices in Tel Aviv Tuesday, in support of the settlement freeze. Continue reading YNET: "Settlement freeze gets icy support". As everyone who follows this issue knows, last week House leadership decided that it was time to move ahead with far-reaching, probably counter-productive Iran sanctions (HR 2194 - for APN's view on this bill, click here). As of yesterday afternoon, the popular wisdom (including among many House supporters of that bill), was that this is a risk-free strategy -- in terms of putting the Obama Administration in an awkward position, given that its end-of-year deadline for progress in negotiations has not yet passed, and given the Obama Administration's assumed preference for pursuing multilateral sanctions at the present time. It was assumed to be risk-free because it was assumed that the Senate was not going to move on its own version of IRSPA any time before the new year. Well, popular wisdom was wrong. Continue reading Surprise Senate Push for Iran Sanctions (So much for popular wisdom...). This afternoon Senate leadership sent out a "Hotline" notice to the offices of all Senate Democrats communicating the following: "The Majority Leader asks unanimous consent that the Senate take up and pass CAL #215, S. 2799. CAL #215, S. 2799, Comprehensive Iran Sanctions, Accountability and Divestment Act of 2009. If your Senator has an objection, please contact the Democratic Cloakroom." A similar notice was presumably sent out from Republican leadership to Republican offices. It remains to be seen if any senator will object to the request (if even one Senator does -- and this means putting an informal and usually anonymous "hold" on the bill -- then the bill will not move by Unanimous Consent for the time being). Earlier today Senate leadership today hotlined S. 2799, the Comprehensive Iran Sanctions, Accountability and Divestment Act of 2009. APN opposes passage of the bill in its current form. Click here to download a table containing a section-by-section analysis of the bill, including proposed amendments. We strongly urge Senators to object to this attempt to short-circuit debate (and potential amendments) and fast-track a piece of complex and far-reaching legislation - legislation that would impact virtually every aspect of and every option for US policy toward Iran now and in the future. Continue reading APN Urges Senate to Oppose IRPSA. NY Jewish Week: Iran Sanctions, the Left Wing split and fears about nuclear containment" & JTA NEWS ANALYSIS: "Iran sanctions likely to pass--thanks to Iran"
The measure is "akin to using a chainsaw when a scalpel is in order," said APN President and CEO Debra DeLee. "The threat posed by Iran cannot be bludgeoned away. It calls for a careful and delicate approach." Continue reading NY Jewish Week: Iran Sanctions, the Left Wing split and fears about nuclear containment" & JTA NEWS ANALYSIS: "Iran sanctions likely to pass--thanks to Iran". The Sarasota Chapter of Americans for Peace Now will be holding its annual luncheon gala on Wednesday, February 3, 2010 at Michael's On East, 1212 East Avenue South, Sarasota. Continue reading Middle East Peace Report- December 7, 2009. Washington, D.C - Americans for Peace Now (APN) today urged the House of Representatives to oppose the Iran Refined Petroleum Sanctions Act (IRPSA) in its current form. APN proposed to the House specific changes to the bill, to focus the legislation on smart, targeted sanctions rather than on "crippling" sanctions that inflict widespread suffering on the Iranian people. Continue reading APN Urges House to Oppose IRPSA; Suggests Changes to Sanctions Bill . Moments ago I sent out this call to action to APN's activist list. Continue reading Fight escalation of sanctions against Iranian public. Next week a piece of major Iran sanctions legislation, HR 2194, the Iran Refined Petroleum Sanctions Act (IRPSA) will be brought to the floor under suspension of the rules. This means that there will be only limited debate on the measure and no amendments allowed. We have opposed HR 2194 since it was introduced. We believe at its premise it reflects a misguided and potentially self-defeating approach for the US to the challenge posed by Iran's nuclear program. Our full position on the proper response to Iran can be read here. We oppose this bill, not because we oppose all sanctions. In fact, we have supported and continue to support smart, targeted sanctions that are part of a broader US strategy to deal with this critical foreign policy and national security challenge. Unfortunately HR 2194 is not about smart, targeted sanctions. Continue reading APN to House: IPRSA - A Flawed Iran Sanctions Bill. As noted in last Friday's Round-Up, the House is getting set to vote on (and inevitably pass) the Iran Refined Petroleum Sanctions Act (IRPSA), probably next week. As also noted in the Round-Up, APN opposes this bill. We opposed it when it was introduced and have opposed it every step of the way. Our opposition has never been about timing or political considerations, but about principle: this is bad legislation. Well-intentioned, no doubt, but still bad. Today we sent a message to every House office articulating, again, our opposition to the bill. In addition, we sent along a handy-dandy (or even fancy-shmancy) table laying out our specific concerns with the bill and suggested amendments. Continue reading Why APN Opposes IRPSA (and How IRPSA Could be Fixed). Alpher answers questions about perceived stagnation in the Gilad Shalit negotiations, the announcement of a settlement freeze, and the Swiss referendum on banning the building of new minarets. Continue reading Hard Questions, Tough Answers with Yossi Alpher- December 7, 2009. Continue reading APN Legislative Round-Up for the Week Ending December 4, 2009. On November 17th Danny Seidemann and I wrote about how Netanyahu had chosen the "nuclear option" when it came to Gilo. We meant that in this instance, when the issue of the approval of new settlement construction in East Jerusalem came up, he and his government opted for a strategy that was guaranteed to cause the biggest possible explosion politically, leaving diplomatic scorched earth in its wake. "The Council is deeply concerned about the situation in East Jerusalem. In view of recent incidents, it calls on all parties to refrain from provocative actions. The Council recalls that it has never recognized the annexation of East Jerusalem. If there is to be a genuine peace, a way must be found to resolve the status of Jerusalem as the capital of two states. The Council calls for the reopening of Palestinian institutions in Jerusalem in accordance with the Roadmap. It also calls on the Israeli government to cease all discriminatory treatment of Palestinians in East Jerusalem." Judging from the Israeli reactions of shock, dismay, and outrage, an ignorant (or forgetful) observer might assume that nobody had ever suggested such a thing in the past. That observer would of course be grossly mistaken. What we have here is not the case of anything remotely new or shocking being said by the EU (or of the EU trying to prejudge the outcome of final status talks, as opposition leader Tzipi Livni stated, apparently viewing EU words as more problematic than Israeli settlement activity and home demolitions in Jerusalem -- Tzipi, meet irony. Irony, meet Tzipi. You clearly are not acquainted.). What we have here is a cynical Israel reaction designed, it would seem, to re-set the diplomatic clock back by at least a decade, to a time when politicians and negotiators were still forced to speak in code (not referring explicitly to the fact that a peace agreement would mean the creation of a Palestinian state, let alone the location of its capital). Below is a compendium of Jerusalem-related data points, drawn mainly from the not-at-all-lefty Jewish Virtual Library, for those who are following this and care about the facts involved. Continue reading Israel's Strategic Hysteria over Draft EU Jerusalem Position. The proof of the Israeli government's decision on a (partial) settlement freeze will be in its implementation, and the implementation will be very difficult, said Talia Sasson, a former legal adviser to the Israeli government who perhaps knows more than anyone about the complexities of enforcing the law on Israeli settlers in the West Bank. Continue reading Talia Sasson to APN: Enforcement of Settlement Moratorium will be Difficult. In East Jerusalem, the spoilers are trying to undermine the prospects for peace. Continue reading Can't let the spoilers decide. As our nation faces increasing challenges to both our economy and our security, it is incumbent upon us to make difficult choices and establish priorities for limited taxpayer funds, such as continued robust security assistance to the State of Israel - funding that both advances our national security interests and is mutually-reinforcing. For this reason, we ask that you sign the attached letter to the President requesting that he fully implement our security assistance agreement with Israel and allocate the necessary resources to fulfill this commitment. The U.S.-Israel alliance is particularly important because both nations are democracies facing the common security threat of rogue regimes that pursue deadly weapons, and that sponsor violent Islamist groups which target both Americans and Israelis. The Iranian regime - which repeatedly calls for a world without the U.S. and Israel - continues to advance its uranium enrichment efforts and could have nuclear weapons capabilities as soon as next year. To deliver those weapons and make good on its threats, Iran possesses and is further developing an arsenal of missiles that can strike Israel, U.S. forces in the Middle East, and parts of Europe. Iran and its fellow dictatorship Syria also continue to sponsor Hezbollah and Hamas, which continue to threaten Israel from the north and south. Israel is on the front lines of our struggle against these mounting threats, and that nation has proven itself to be an indispensable ally, sharing her extensive experience in battling militant extremists domestically, militarily, and diplomatically. Israel's qualitative military advantage has, and continues to act as a force-multiplier in the region, thereby playing a vital role in aiding U.S. forces in the Middle East, and beyond. That is why successive Administrations have supported a robust U.S.-Israel alliance. But to address these growing threats, Israel must spend more proportionately on defense than any state in the Western world - paying for increasingly sophisticated, varied, and costly weapons systems needed to maintain its qualitative military edge. Therefore, in 2007 the U.S. and Israel concluded an agreement to increase U.S. security assistance to Israel over the next decade. Because the international community has failed to apply strong sanctions to compel the Iranian regime to change course, the threat to our security - and Israel's very existence - has never been greater. Therefore, the attached letter asks the President to fully implement our security assistance pact with Israel, ensuring that both of our nations can protect ourselves and each other against this threat. To co-sign the letter, please contact Alan Goldsmith or Matthew Zweig at X68467. Continue reading Ileana Ros-Lehtinen (and Brad Sherman?) Bravely Defend Israel Aid... from ZERO threat. My colleague Ori Nir just finished an interview with Yariv Oppenheimer, the director general of the Israeli Peace Now movement. Continue reading Peace Now brings transparency to settlements.